The only Founding Father not born into a wealthy planting family, Alexander Hamilton was one of the first self-made men in America. Hamilton entered the world an illegitimate child— born in in the British West Indies. Orphaned at a young age, Hamilton arrived in New York and enrolled as student at Kings College (now Columbia University) in 1773. An ambitious social climber, he foresaw the opportunity in the burgeoning revolution and left his studies to be Commander in Chief George Washington’s aide-de-camp in 1777. 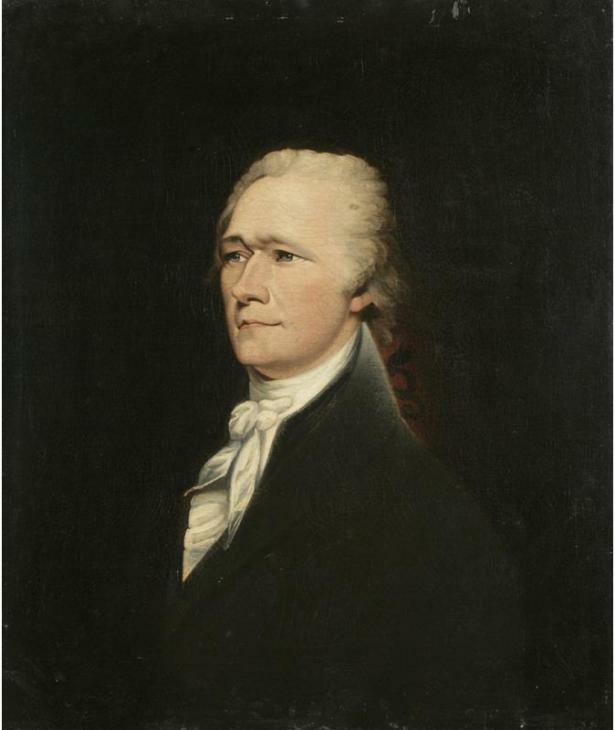 Following the patriots’ victory in 1781, Hamilton passed the New York Bar to become a leading Federalist and ardent supporter of the Madison’s Constitution. Under the pseudonym Publius, he penned more than two thirds of The Federalist, a series of 85 essays that effectively convinced Americans of the need for a strong central government; the need for a federal Constitution to end the chaotic years under the disjointed Articles of Confederation. For his fiscal genius, he was appointed the first Secretary of the Treasury in 1789, where he crafted the U.S. Mint and championed the First Bank of the United States. But his prolific career was overshadowed by personal scandal and cut short by an infamous death. In 1804, his longtime political rival and then-vice president Aaron Burr challenged him to a duel, where 49-year-old Hamilton was mortally wounded. More than two centuries after his death, Hamilton continues to influence American popular culture. Today he can be seen on the $10 bill and his unlikely story has been adapted for the stage. It’s now a hit Broadway musical that shares his name. Video: What is the oldest NYC newspaper still in circulation?